I went to FSCONS this weekend, whereupon I talked to a friend of mine about NaNoWriMo, since I had figured out that he was participating as well. We started talking about how it’s not supposed to be editable, and how awesome it would be if we could just have a nifty little program that let you see the word count when you write, but you wouldn’t be able to stop and edit what you were writing. And through that you would just keep the flow going. That same evening he poked me when I got home, he had left the conference earlier than me, and said I got the program, try it out! I was exhausted from an awesome day (that I will write more about later) but said I would try it the morning after and so I did. I immediately fell in love with it. I knew I would be able to use it to get my writing done, and I wouldn’t be able to look back! Yesterday I caught up writing 4k words! 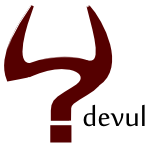 He decided to name it Devul, The name “devul” is a combination of “/dev/null” and “devil”. One of the reasons for why I felt this would be a good tool to use is the tip, that all of us keep getting over and over while writing our NaNo, Don’t look back! Whatever you do, don’t read over what you’ve written until you are finished. That is an easy way to get distracted. Remember, you’ll have to edit the thing many times before your piece of art is perfected. Just write forward, don’t make corrections, don’t read over it, just push forward and write. One thing that is quite important to remember though, is that in order to use this particular tool you basically have to be decently sure you can write without seeing anything of what you write, since it only offers you a box with the words you’ve written and the words per hour count. Words per hour gives you a rough idea how much longer you’d have to write to catch up. You will be wanting to edit it when you’re done with your session, or have catched up with the word count for the day, though. At least I’d say so from my personal experience, since you will do a lot of misspelling and might even totally screw up things and not have an idea of what you were trying to write unless you go back to it when you have a fairly rough idea of what you wrote and it is still fresh in your head. You can expect mistakes like ”klkiillikely”, which was supposed to be ”likely”. The application now writes out how long you’ve been writing (started minute), how many words and at what pace, when you exit it. Here are some examples of mine. During 19 minutes, 1278 words were added at a pace of 3894 words per hour. During 13 minutes, 633 words were added at a pace of 2900 words per hour. During 20 minutes, 955 words were added at a pace of 2846 words per hour. During 14 minutes, 948 words were added at a pace of 3896 words per hour. During 14 minutes, 790 words were added at a pace of 3207 words per hour. It’s important to note that the program saves your text Every word you write/Everytime you press spacebar. So you don’t have to worry about loosing more than a word. To take this project further we, well Olof mainly, need your input on what you want. It currently works best/easiest in Linux, or if you have python ready to set play on your OS of choice. If you don’t know what Python is, well… Let’s not go there. I’m looking forward to how this develops, but right now we need you Linux users out there who want to help us develop it!